This year for Christmas, plan a carnival for all ages. A holiday gathering that includes easy crafts, silly games and the coolest snacks this side of the North Pole will leave everyone feeling merry. Carnivals are festive and spirited so get set to brighten this year's Christmas with an unforgettable party. Start with a snazzy invitation. On holiday paper you find at a party or stationary store, handwrite the invitation, including the date, place, time and theme. Fold it and place it inside a small box that you wrap with Christmas paper. Tie on candy canes (one for each family member you're inviting) with a pretty bow and hand-deliver the package to your guest. Friends and family will love the special attention. In addition to your decorated Christmas tree, you should deck your halls with traditional Christmas embellishments to set the carnival mood. Sprigs of holly and mistletoe on stairways, railings and in doorways is a must. Christmas lights can be hung around windows inside your home to add brightness and warmth. Jingle bells add a wonderful holiday sound when placed around door handles, kitchen cabinet knobs and tied to the ends of serving pieces. Wreaths hung on doors and walls are great Christmas decorations. For a sweet wreath everyone will love, tie a variety of hard candies in their wrappers to a ready-made wreath. Attach a pair of scissors to the wreath with long string and when guests pass by, they can snip off a sweet if they want. To keep small guests busy at your carnival, set up an area named Santa's Workshop. This is where kids can “work.” On a card table covered with a bright red plastic tablecloth, set out bowls of stringables – lifesavers, tiny pretzels, cereals with a whole in the middle (Cheerios, Trix,) and gummy rings - anything edible that can be strung. Include heavy-duty thread and let the kids dig into the bowls and string garland necklaces. They will love wearing them and taking a bite whenever they get the urge. Set up a second table in the workshop for children (and adults, if they want to prance around in the coolest of holiday head gear) to make reindeer antlers. From brown poster board, cut 1 1/2-by-24-inch-long strips for headbands. Cut 6-by-9-inch rectangles for antlers (two for each person). Help each guest wrap a strip around their head for a good fit, remove it, and staple the ends, overlapping as necessary. On the rectangular poster board, draw a pair of antlers and cut them out. If guests want to spiffy up their antlers, have glitter and glue available. Otherwise, simply staple the antlers to the front of the headband. A nice finishing touch is red face paint on each person's nose for the full Rudolph effect. Now that we're reindeers, it's time for some games. First up is the snowblowers challenge. To set up, tape four large decorated (with Christmas or glittery wire ribbon) paper cups, open end up, to one side of a table so that the cups are level with the table. Fill each cup halfway with small prizes like candy canes, chocolate mints, colored pencils and bright erasers. Two players at a time are given decorated (like the cups) paper towel tubes and given game instructions: A ping pong ball will be placed in front of each of them, they must gently blow through their tube to get the “snowball” rolling across the table and into one of the paper cups. If the ball goes over the edge, that player's turn is over. If the ball makes it into one of the cups, they get to pick a prize from that cup. The game continues until each cup is empty. Grown-ups love this next game. It's called Stuff the Santa. This merry game pits teams against each other in a race to see who can create the fattest Santa of them all. You'll need to borrow or buy an extra large red one-piece union suit (or plain cotton one- piece pajamas, if you can't find one) and blow up lots and lots (I mean lots) of red balloons. Teams of four to six players are given the task of stuffing the suit, with one team member inside, with as many balloons as possible in 2 minutes. Be careful! Santa pops easily. When time is up, Santa must show off his lumpy physique before counting balloons. The next team tries to top the previous record. A carnival must have fun food so put a little twist on the ordinary presentation. Instead of a platter of vegetables and dip, how about a Crudi-tree? Start with a 12-inch, green Styrofoam cone and use toothpicks to attach vegetables like broccoli, cucumbers, olives, cherry tomatoes, cauliflower and red and yellow peppers. Arrange the vegetables in a pattern, creating an edible Christmas tree. Top the tree with a yellow star cut from your favorite cheese, and serve with your best vegetable dip. And how about a Cheese Ball Snowman? Fashion two cheese balls, from two 8-ounce packages of cream cheese, for the head and body. Now decorate! Use raisins for his eyes, mouth and buttons; broken pretzels for his arms; fruit leather for his scarf, and a piece of carrot for his nose. Top his head with a hat made from one large round cracker on the bottom, and three smaller ones stacked on top. Serve with crackers and mini bagels. For a last minute treat, fill a jar with red and green jelly beans. Decorate the jar with pretty holiday ribbon. Ask each guest to guess how many jelly beans are in the jar by writing their name and best estimate on a piece of paper. At the end of the party, read the guesses and announce the correct number. The person closest wins the jar. 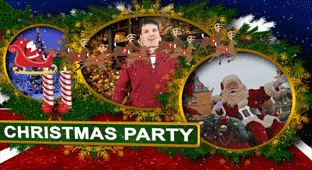 There are many more fun activities you could include in a Christmas carnival. Use your imagination and think up some of your own fun. It is a festive and jolly way to spread Christmas cheer.